Lower right, on carpet: "DE TROY 1735"
A woman getting ready for the ball is caught mid-sentence as the two women lean in to listen to her and the maid puts the finishing touches on her mistress’s hair. Partially disguised and holding masks, the ladies wear lavish cloaks in anticipation of the evening festivities ahead. Candles flicker, illuminating the eager faces of the group and contributing to the mood of hushed expectancy. Jean-François de Troy developed the tableaux de mode— depictions of scenes from upper-class life with an emphasis on sumptuous costumes, opulent interiors, and hints of amorous intrigue. At the time, some critics disapproved of the aristocratic life of leisure celebrated by paintings like this one. Before the Ball was exhibited at the Paris Salon of 1737 with its companion piece, After the Ball. When exhibited, the pair was declared de Troy's finest work. Germain-Louis de Chauvelin, marquis de Grosbois and garde des Sceaux, French, 1685 - 1762 (Paris, France), commissioned from the artist, 1735; paintings apparently left behind in Paris upon his exile, 1737. Thomas Pares, 1746 - 1824 (Hopwell Hall, Derby, England), by inheritance to his brother, John Pares, 1824. John Pares, 1749 - 1833, by inheritance to Thomas Pares, 1833. Thomas Pares, 1790 - 1866, by inheritance to Thomas Henry Pares, 1866. Thomas Henry Pares, 1830 - 1878, by inheritance to Edward Henry Pares, 1878. Morton Lee, Esq. (London, England), sold to Wildenstein & Co., 1948. Wildenstein & Co. (New York) (New York, New York), sold to the J. Paul Getty Museum, 1984. Explication des peintures, sculptures, et autres ouvrages de messieurs de l'Académie Royale [...] (Paris: Jacques Colombat, 1737), p. 7. E. F. Gersaint, Paris. Catalogue d’une grande collection de tableaux […]. March 26, 1749, pp. 7-8, lot 48. Rémy, Paris. Catalogue de tableaux originaux des trois écoles [...] & autres effets du cabinet de M. Prousteau, capitaine des gardes de la ville. June 5, 1769, p. 19, lot 46. Paillet, Paris. Catalogue des tableaux, dessins, gouasses et estampes, provenants du Cabinet de M.***. May 17, 1774, p. 18, lot 138. "Extrait de la vie de M. J.-F. de Troy." In Mémoires inédits sur la vie et les ouvrages des membres de l'Academie Royale de peinture et de sculpture. Louis-Étienne Dussieux, ed. 2 vols. (Paris: J.B. Dumoulin, 1854), vol. 2, p. 276-77. Blanc, Charles. "Jean-François de Troy." In Histoire des peintres de toutes les écoles. Vol. 7, École française. 11 vols. (Paris: Renouard, 1865), pp. 12-13. Collection des livrets des anciennes expositions depuis 1673 jusqu'en 1800. Vol. 1, Exposition de 1737. 6 vols. (Paris: Liepmannsohn et Dufour, 1869), p. 14. Goncourt, Edmond de, and Jules de Goncourt. La Femme au XVIIIe siècle (Paris: Firmin-Didot, 1887), pp. 102-3. Cumberland and Sons, Derby. Hopwell Hall: Catalogue of the Costly and Valuable Contents of the above Mansion [...]. December 11-14, 1893, p. 26, lot 432. Lady Dilke (Emilia Francis Strong Dilke). "Jean-François de Troy et sa rivalité avec François le Moine." Gazette des Beaux-Arts 1 (April 1899), p. 268, n. 2, ill.
Lady Dilke (Emilia Francis Strong Dilke). French Painters of the XVIIIth Century (London: G. Bell and Sons, 1899), p. 30, n. 4. Boehn, Max von. Die Mode: Menschen und Moden im achtzehnten Jahrhundert, nach Bildern und Stichen der Zeit ausgewählt (Munich: Bruckmann, 1919), p. 82, ill.
Dacier, Emile. La Gravure de genre et de moeurs (Paris: G. van Oest, 1925), p. 72, under no. 53. Brière, Gaston. "De Troy." Les Peintres français du XVIIIe siècle: histoire des vies et catalogue des oeuvres. Louis Dimier, ed. 2 vols. (Paris: G. Van Oest, 1930), vol. 2, p. 44, nos. 25-26. Brière, Gaston. "Jean-François de Troy, peintre de la société élégante, nouveaux renseignements sur l'oeuvre de l'artiste." Bulletin de la société de l'histoire de l'art français (1931), p. 165. Roux, Marcel. Inventaire de Fonds Français: graveurs de dix-huitième siècle. 15 vols. (Paris: Bibliothèque nationale de France, 1933), vol. 2, pp. 205, 211-12, under nos. 15-16. Boehn, Max von. Modes and Manners. Joan Joshua, trans. (London: Harrap, 1935), p. 110. Hautecoeur, Louis. Les Peintres de la vie familiale: évolution d'un thème (Paris: Éditions de la Galerie Charpentier, 1945), p. 58. Watson, F. J. B. "A Note on Some Missing Works by De Troy." Burlington Magazine 92, no. 563 (February 1950), p. 50. La douce France/ Det ljuva Frankrike: Mästermålningar från tre sekler, exh. cat. (Stockholm: Nationalmuseum, 1964), unpaginated, no. 1, ill.
"Without the Benefit of Labels." Art News 67, no. 8 (December 1968), pp. 35, 58, ill.
Fried, Michael. Absorption and Theatricality: Painting and the Beholder in the Age of Diderot (Berkeley: University of California, 1980), p. 195, n. 90. Fredericksen, Burton B. "Recent Acquisitions of Paintings: The J. Paul Getty Museum." Burlington Magazine 127, no. 985 (April 1985), pp. 263, 266, fig. 98. "Acquisitions/1984." The J. Paul Getty Museum Journal 13 (1985), pp. 210-11, no. 140, ill.
Laing, Alastair, et al. François Boucher, 1703 -1770, exh. cat. (New York: Metropolitan Museum of Art, 1986), pp. 181-82, under no. 33. Fredericksen, Burton B. Masterpieces of Painting in the J. Paul Getty Museum. Rev. ed. (Malibu: J. Paul Getty Museum, 1988), unpaginated, no. 34, ill.
Bordeaux, Jean-Luc. "Jean-François de Troy--Still an Artistic Enigma: Some Observations on His Early Works." Artibus et historiae, no. 20 (1989), p. 143-69. Stafford, Barbara Maria. Artful Science: Enlightenment Entertainment and the Eclipse of Visual Education (Cambridge: MIT Press, 1994), pp. 23, 27, ill.
Fredericksen, Burton B., et al. Masterpieces of Painting in the J. Paul Getty Museum. 3rd ed. (Malibu: J. Paul Getty Museum, 1995), unpaginated, no. 33, ill., entry by Burton B. Fredericksen. Rand, Richard. Intimate Encounters: Love and Domesticity in Eighteenth-Century France, exh. cat. (Hanover: Hood Museum of Art, Dartmouth College, 1997), p. 186, no. 42, ill.
Fredericksen, Burton B., et al. Masterpieces of the J. Paul Getty Museum: Paintings (Los Angeles: J. Paul Getty Museum, 1997), p. 80, no. 43, ill., entry by Burton B. Fredericksen. Phillips, London. Old Master Paintings. July 4, 2000, pp. 102, 104, under lot 76, ill. The J. Paul Getty Museum Handbook of the Collections. 6th ed. (Los Angeles: J. Paul Getty Museum, 2001), p. 128, ill.
Leribault, Christophe. Jean-Francois de Troy (1679-1752) (Paris: Arthena, 2002), pp. 68, 343-44, no. P.234. Bailey, Colin B., Philip Conisbee, and Thomas W. Gaehtgens. 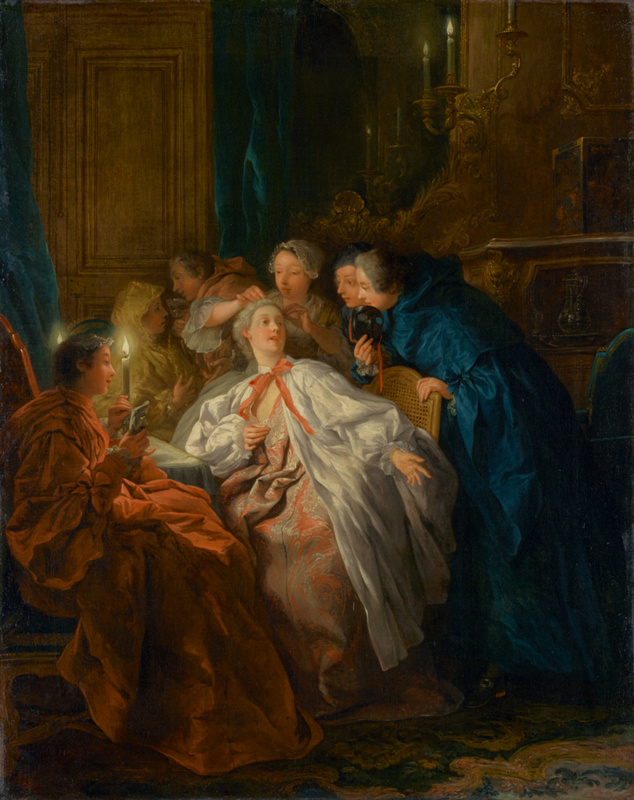 The Age of Watteau Chardin and Fragonard: Masterpieces of French Genre Painting, exh. cat. (Ottawa: The National Gallery of Canada, 2003), pp. 172-73, 359, no. 27, ill., entry by Christophe Leribault. Baxter, Denise Amy. "Fashions of Sociability in Jean-François de Troy's tableaux de mode, 1725-1738." Ph.D. diss. (University of California, Santa Barbara, 2003), p. 163. Allen, Denise, et al. Masterpieces of Painting in the J. Paul Getty Museum. Rev. ed. (Los Angeles: J. Paul Getty Museum, with Thames & Hudson, 2003), p. 77, no. 41, ill., entry by Burton B. Fredericksen. Baillio, Joseph, et al., eds. The Arts of France from François Ier to Napoléon Ier: A Centennial Celebration of Wildenstein's Presence in New York, exh. cat. (New York: Wildenstein and Company, 2005), pp. 55, 72, no. 32, ill.
Leloir, Maurice. Histoire du costume de l'antiquité à 1914. 12 vols. (Paris: Ernst, 1933-1949; repr. Paris: Société de l'Histoire du Costume-Amis du musée Galliera, 2007), vol. 12, p. 24, fig. 1. Baxter, Denise Amy. "Fashions of Sociability in Jean-François de Troy's tableaux de mode, 1725-1738." In Performing the "Everyday." Alden Cavanaugh, ed. (Newark: University of Delaware Press, 2007), pp. 28, 31, 42, fig. 4, cover ill.
Bremer-David, Charissa, ed. Paris: Life & Luxury in the Eighteenth Century, exh. cat. (Los Angeles: The J. Paul Getty Museum, 2011), pp. 92, 133, fig. 53, no. 99a, entry by Emily Beeny. Hellman, Mimi. "Enchanted Night: Decoration, Sociability, and Visuality after Dark." In Paris: Life & Luxury in the Eighteenth Century, exh. cat. Charissa Bremer-David, ed. (Los Angeles: The J. Paul Getty Museum, 2011), pp. 91, 92, 94, ill.
Delon, Michel, ed. Le XVIIIe siècle libertin, de Marivaux à Sade (Paris: Citadelles & Mazenod, 2012), p. 245, ill.
Zafran, Eric. Review of French Eighteenth-Century Paintings in American Museums. National Gallery of Art. Burlington Magazine 159, no. 1373 (August 2017), p. 670. Jackall, Yuriko, et al. America Collects Eighteenth-Century French Painting, exh. cat. (Washington, D. C.: National Gallery of Art, with Lund Humphries, 2017), pp. 193, 281, 304, pl. 27.